WASHINGTON, D.C. 1/31/15 – Obama is the most anti-Christian, anti-God, anti-morality, anti Constitutional "president" in the history of The United States. He has ordered military chaplains to NOT speak the name of Jesus in chapel services, at funerals or when counseling a distressed suicidal military man or woman. When he visits a church where he will speak, he first demands that The Cross and every religious symbol be covered so as not to offend him. He would like to see Christianity itself abolished. And America has allowed this to continue. Quotation marks were put around the word, "president" (above), since Obama was not voted into the White House. He was shoe-horned in by the Communist Party USA (CPUSA) who sponsored him and helped rig voting machines all over America, plus he pushed for an end of the requirement to show ID's when voting, since, saith he, "it provides a hardship that keeps minorities from voting." This ploy enabled many to vote numerous times. Obama was not voted in, this was a silent coup. With the help of CPUSA, Obama took part in the greatest fraud in history. Yet, our spineless representatives have not taken action to remove this impostor from the Oval Office even though he was not born in America, which is a prerequisite to even run for that office. He has given boldness and comfort to enemies of America who want only to see us blasted off the face of the earth. He bowed low to an Arabian King, welcomes Muslims into The White House to commemorate an Islamic ritual celebration, while not allowing any Christian leader in the White House on the Day of National Prayer, nor did he participate in it. He apologizes throughout the world calling America "arrogant." When an American hero dies, Obama will not trouble himself to call that hero's family. BUT he is quick to call anyone with a high profile who 'comes out' of the closet and declares himself or herself 'gay.' He immediately calls personally to "congratulate" them. He pushes Common Core for the education of our children which not only distorts our history, but dumbs down the basic skills of the three R's – reading, writing and 'rithmetic, by steering them away from a speedier answer to math problems, bogging down students, demanding time-consuming roundabout ways to solve the problem which prevents the efficiency of timely solutions, actually killing math skills. Furthermore, he has wrecked our economy, tripled our national debt, stoked racial wars, and has an Attorney General who refuses to uphold the constitution. However, he is truly keeping his promise to Joe The Plumber (given at the beginning of his 'presidential campaign') to "re-distribute the wealth." That means taking money from the working rich and middle class to give to people who do not want to work but will vote for him and his ideas since he gives them cash, food stamps, free medical, dental, and Section 8 housing, meaning they pay only what they want to pay for rental homes in upscale areas to live amongst people who have worked hard for what they have, precisely so that they can live in an upscale neighborhood. And the working people pay for all of this. This is 'redistributing the wealth. Perhaps the most shocking of all is Obama's seeming hatred for Israel. He regularly criticizes them for defending themselves against horrific attacks from their Islamic neighbors, which they have every right to do. And when they do respond, they carry out their retaliation carefully in an effort to protect civilians, hospitals and schools. The very opposite of those hostile countries who want to kill everyone. Israel is the best friend America has ever had. They are the only democracy in the Middle East. God gave the Jews that land with a promise it would be theirs forever, which is seen in The Bible. Yet Obama has, on more than one occasion, snubbed the Prime Minister of Israel, Benjamin Natanyahu. The most disturbing snub of all is coming up. The Speaker of The House, John Boehner, invited Mr. Natanyahu to speak before a joint section of Congress, which Israel's Prime Minister accepted. Obama has made it clear that he has no intention of meeting with or welcoming this ally when he comes to The United States. Obama is not a friend of Israel, or even a friend of The United States, He only supports The Communist Party, Muslims, and LGBT members to the extent of even demanding that embassies everywhere fly the Rainbow Flag to honor them. Even though the Democrats were steamrolled in this past election with voters putting in congresspersons and senators that will uphold the Constitution, Obama clearly stated that he is prepared to veto any house or senate vote that goes against his agenda. He will ramrod his Communist agenda upon the citizens, no matter what the American people want and democratically vote for. Obama has alienated our allies and supporters including the best friend America has ever had. 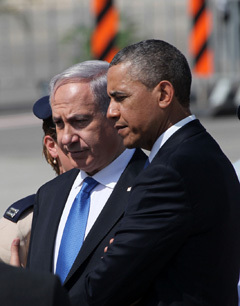 Recent reports from Israel suggest that Obama and his political allies are actively working to oust Israeli Prime Minister Benjamin Netanyahu in the upcoming March elections. According to Jewish Voice, a reporter for the left-leaning, anti-Netanyahu newspaper, Haaretz, revealed in an article in Tuesday's Hebrew edition of the paper that an organization called "One Voice" – largely funded by wealthy Obama political donors – is conducting a campaign to defeat Netanyahu's national ticket in the March 2015 Knesset elections. In fact, the effort has now flown in a team of five veteran Obama campaign operatives (including Jeremy Bird, the Obama campaign's national field director) to run the anti-Netanyahu campaign from offices taking up the ground floor of a Tel Aviv office building. In other words, Team Obama has put both its immense donor network and its political campaign operatives at the disposal of those working to get Netanyahu voted out of office. There is no small measure of irony in this startling revelation. It comes right on the heels of the Obama Administration's very public scolding of Prime Minister Netanyahu and House Speaker John Boehner over the Speaker's invitation to have Mr. Netanyahu speak to a joint session of Congress. Obama has snubbed Mr. Netanyahu in the past and now the most vile snub of all is about to be played out. The occupier of The Oval Office will not even acknowledge the prime minister when he comes to Washington, D.C. If we had a real president in office, this would never happen. We cannot say that Obama is the worst president in American history because he is not a legitimate president. Yet we simply snooze on as he drives America over the cliff. It is way past time for America to turn off the TV sets, clear their minds and – THINK! We have been kept so busy with questionable entertainment to soothe all tastes, that we pay little attention to what our government is actually doing, just like the Romans Bread and Circus tactic to keep the people so occupied and distracted that they could not comprehend what was going on around them. For God's sake, people, take heed of The Bible and WAKE UP! Can't you see what is happening? Can you not see what the future will be if this is allowed to continue unchallenged? Question: Why would a Christian minister be writing this kind of political stuff? Answer: As a minister I am also charged with "defending the faith," our churches, our ministers. Those who simply identify as Christians are now endangered, as Obama determines to make us and our churches extinct and to declare us improper for society. His goal is to see that we have no rights or freedom of religion. He is an enemy of God, our faith and an enemy of all of us who love Jesus. We are indeed in a Spiritual Battle concerning 'Spiritual Wickedness in High Places." It is good against evil. God can put an abrupt stop to this, ONLY if all Christians and pastors will humbly re-dedicate ourselves to Jesus and then act and live like Christians are supposed to, with God at the helm. And above all, to stand firm in our beliefs and faith without wavering.